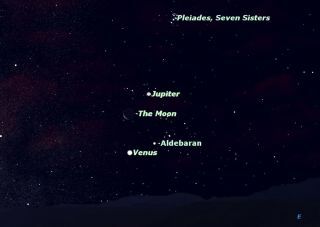 On the morning of Sunday July 15, 2012, the planets Venus and Jupiter joined with the red giant star Aldebaran and the waning crescent moon in a quadruple conjunction. The Pleiades star cluster is nearby. A trio of planets and the crescent moon are poised to put on a dazzling pre-dawn sky show on Sunday (July 15), but if cloudy weather blocks your view, don't fret. You'll be able to watch the celestial sight online, too. The online night sky observing website Slooh Space Camera will provide live views of the moon and bright planets Venus and Jupiter from one telescope on Sunday, with another instrument showing the ringed planet Saturn. To capture all three planets and the moon in the night sky, Slooh Space Camera will make use of telescopes in two parts of the world. Slooh's telescope at the Canary Islands Observatory in Spain will be used to observe Venus, Jupiter and the crescent moon in the eastern sky. In the Canary Islands, the sky will be in its pre-dawn twilight, with the moon only 12 percent illuminated on Sunday morning, Slooh officials said. This should make it possible to see the so-called "earthshine" effect on the moon's darkened portion. Earthshine is an effect caused by sunlight that is reflected onto the moon by Earth, casting the moon's normally darkened areas in a ghostly light. The moon and Jupiter will also put on a separate celestial show early Sunday, as Jupiter appears to slip behind the moon, as viewed from Earth. During the Slooh webcast, Jupiter's icy moon Europa and volcanic moon Io should be visible as they orbit the planet. The bright star Aldebaran will also be visible with Jupiter and Venus, and should appear to the lower right of the moon on Sunday morning. While the Canary Islands Observatory observes the moon, Jupiter and Venus, a telescope at the Prescott Observatory in Arizona — where the local time will still be late Saturday night — will stream live views of the ringed planet Saturn. Saturn is visible along with Mars and the bright star Spica in the western sky in the late evening. Astronomer Matt Francis of the Prescott Observatory will join Slooh president Patrick Paolucci and producer Paul Cox during the webcast. Editor's note: If you snap photos of the moon, Venus, Jupiter or Saturn that you would like to share with SPACE.com for a story of gallery, send images and comments to managing editor Tariq Malik at tmalik@space.com. You can follow SPACE.com Managing Editor Tariq Malik on Twitter @tariqjmalik. Follow SPACE.com on Twitter @Spacedotcom. We're also on Facebook and Google+.